One key set of requirements in the Paris Agreement that countries need help in understanding and carrying out is the Agreement's enhanced framework for the transparency of action and support. The transparency framework will play a critical role in enabling the tracking of countries' climate efforts and progress towards their commitments, including through national transparency reports and reviews every two years. It builds on 20 years of arrangements under the UNFCCC to measure, report and verify the actions of individual countries, but it imposes more stringent, detailed and demanding requirements. 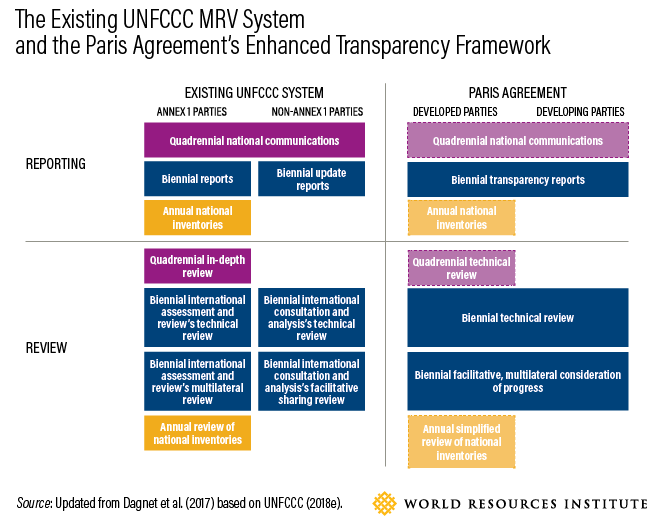 To help countries figure out how to respond to these new requirements, today WRI published Building Capacity for the Paris Agreement's Enhanced Transparency Framework: What Can We Learn from Countries' Experiences and UNFCCC Processes? The working paper examines the Paris Agreement's enhanced transparency arrangements, with an eye to the challenges and opportunities that this new transparency regime will pose for countries. Then, drawing on country experiences and case studies, the paper identifies six essential lessons for building countries' capacity to implement the Paris transparency framework and highlights activities and initiatives that can help countries build their transparency-related capacity. What Makes the Paris Agreement's Transparency Framework "Enhanced," and What Are Its Implications? At COP24 in December 2018, Parties agreed on the set of the modalities, procedures and guidelines that detail how the Paris Agreement's enhanced transparency framework will work. As highlighted in the diagram below, the new enhanced transparency framework consists of a common set of guidelines for all countries. This is a significant shift from the previous approach under the UNFCCC, which involved two separate guidelines for developed and developing countries and resulted in differing levels of quality of information. This shift raises significant challenges. Developing country Parties have struggled to fulfill their already-existing requirements under the pre-Paris system. Cooperation among countries to build and mobilize capacity will be vital if all Parties, especially developing countries, are going to meet the new transparency requirements. Moreover, countries will have to build and mobilize human, institutional, technical and financial capacity faster than they have so far—and this capacity will need to be more effective, efficient, integrated and sustained than current efforts. Otherwise, countries will be unable to implement the Paris Agreement at the scale required. WRI's examination of current capacity-building support and other efforts in 13 case studies illuminated six key lessons. These lessons are not all-encompassing and do not represent all knowledge on capacity building for transparency. However, these key lessons can serve as reference points when building capacity for the enhanced transparency framework and the implementation of the Paris Agreement. 1. Building or developing capacity is a process that takes time and depends on countries "learning by doing." Developed countries, such as Japan, have built their existing capacity over an extended period during the past 20 years. Expectations that developing countries will build their own capacity in a short period of time are unrealistic. But by building on their own experiences and lessons learned, countries' measurement, reporting and verification systems can be strengthened more quickly and sustainably. This is reflected in Ghana's current efforts under their Climate Ambitious Reporting Program established in 2013 to enhance domestic measurement, reporting and verification (MRV) systems. 2. Capacity for transparency can be strengthened through enhanced institutional arrangements. Institutional arrangements and governance structures can play an important role in ensuring data collection—including through establishing inter-ministerial coordination mechanisms (such as in the Dominican Republic) and multi-stakeholder engagement, especially with the private sector (such as the process with private sector stakeholders in South Korea). 3. Legal and regulatory architecture, supported by an enhanced governance structure, can play a key role in sustaining regular tracking of countries' efforts. Legislation and other regulatory measure can have a great influence on countries' efforts to gather and track data. Laws and regulations can demonstrate a country's commitment and sustained approach to the collection of mitigation and adaptation data, as has been the case with Mexico. 4. Tracking tools and platforms are emerging to increase countries' abilities to monitor support received and progress toward their commitments. Countries are finding new and innovative ways to build and mobilize their capacity. Innovative, interactive, comprehensive tracking tools can make it easier for stakeholders and decision-makers to understand data and to understand and track implementation toward countries' NDCs. The paper provides examples from the NDC Partnership and Colombia as well as touches on emerging applications of blockchain technology. 5. Capacity building can be strengthened by leveraging opportunities for the integration of sustainable development goals and efforts for policy coherence. At the same time that countries address climate change, they can also advance sustainable development considerations, including those involving gender. For instance, Vanuatu developed an "Integrated MRV framework" tool that helps policymakers assess sustainable development impacts of mitigation actions that advance both their NDC and their SDGs and in its latest report the country showed how it mainstreamed gender through its MRV system. 6. Leveraging existing institutions to build lasting systems and knowledge are critical to sustain capacity. Efforts to build capacity must ensure that knowledge is not lost if individuals change jobs. Instead, capacity-building efforts must ensure systems capacity is built by investing in and leveraging existing institutions to build or inform national GHG inventories, such as statistical organizations, universities (as has been done effectively in the Dominican Republic) and civil society initiatives, such as those to gather data in India and Brazil. Capacity-building support can be found both within and beyond the UNFCCC and Paris process. In particular, a number of the processes organized by the Paris Agreement—including transparency reporting and review, the global stocktake and the mechanism to facilitate implementation and promote compliance—provide important venues for strengthening capacity. These processes can foster capacity-building through the reporting exercise itself, through the interactions between technical review experts and the country being assessed, through the sharing of experience through peer exchange, and through the expert assessment of individual and systemic issues. Furthermore, the UNFCCC has organized several key bodies to support the implementation of the Convention and the Paris Agreement, including with a focus on transparency efforts. The Paris Agreement established the Capacity Building Initiative on Transparency (CBIT) and created the Paris Committee on Capacity Building (PCCB), which is tasked with support efforts related to implementation of the Paris Agreement (as a whole, not just the enhanced transparency framework). Also, at COP24, countries decided that the Consultative Group of Experts (established 20 years ago to specifically support transparency reporting) will now serve under the Paris Agreement, based on terms of reference yet to be updated. A number of international initiatives support transparency-related efforts at varying levels of scope. Some focus on transparency, like the Initiative for Climate Action Transparency (ICAT) and the Partnership on Transparency in the Paris Agreement (PATPA). Others have a geographic or stakeholder focus, like the Partnership to Strengthen Transparency for co-Innovation (PaSTI) in Asia-Pacific countries and targeting the private sector. Finally, some have a broader scope, like the NDC Partnership or the GCF Readiness program. Government officials and institutions should are not the only ones for whom capacity building and mobilization is critical. The millions of young people who took on the street on Friday 15^th^ of March and the response from the UN Secretary General, mayors, CEOs are reminders of the groundswell of non-state actors that must be mobilized to accelerate at an unprecedented pace climate action in a transparent and equitable manner. Making sure that these actors empowered to participate fully in the implementation of the Paris Agreement is paramount.